Aldi's discounts are a big attraction for grocery shoppers looking for a bargain. Nearly nine in 10 Americans say they try to pay less for groceries, clothing and other consumer goods by regularly shopping at discount retailers, research by the National Retail Federation (NRF) finds. Of more than 3,000 U.S. adults polled by NRF, 89% reported that they shop at various discount-focused retail chains. Fifty-eight percent of these consumers said they shop at dollar stores, 50% shop at discount grocers such as Aldi or Lidl, 50% shop at off-price stores like Ross or T.J. Maxx, 44% shop at outlet stores and 36% shop at thrift stores. Shopping for value also has become ingrained in consumers’ store trips, NRF’s study revealed. Among those surveyed, 43% visit a discount grocer each week, 66% go to a dollar store at least twice monthly and 58% visit an outlet store once a month or more. Seventy-five percent of value shoppers named clothing as the item they’re most likely to buy at discount retailers, followed by groceries (71%), home decor and furnishings (62%), personal care and beauty products (60%) and electronics (52%). Among these products, respondents said they’re most likely to make their purchase at a discount grocer (58%) for groceries, at an off-price store (51%) for apparel and at a dollar store (44%) for personal care and beauty. What drives value-oriented consumers? The top three reasons cited for going to discount retailers were “it’s cheaper or more cost-effective” (67%), “to find a deal” (65%), and variety or selection (40%), according to the survey. For example, among the things value shoppers don’t expect discount/bargain retailers to offer, 77% named an entertaining shopping experience, 72% said the ability to buy online and 66% cited quality customer service. Most of these consumers also don’t expect it to be easy to find things (64%), flexible returns (64%) and simple checkout (63%) at discount retailers. Sixty-three percent of shoppers polled said they’re buying more items on sale versus five years ago, and 29% reported that they always do price checks at bargain/discount retail stores. Also, if an item isn’t on sale, 76% of respondents said they will look elsewhere for a better price, wait for a sale, or seek a coupon or promotion. Half of discount-focused consumers say they shop at value chains such as Aldi. Taking a closer look at the discount retail consumer, NRF found that 53% of women and 47% of men surveyed described themselves as a value shopper. Forty-six percent said they have children. Income doesn’t seem to be a factor, as all levels showed a high percentage of value shoppers, according to the study. Of respondents who shop at various discount retailers, 90% earn more than $100,000 annually, 88% make $50,000 to $100,000 and 89% have income of less than $50,000. Young adults exhibit a high affinity for value shopping, with 93% of Millennials (ages 24 to 37) and Generation Z (ages 18 to 23) reporting that they shop at discount retail stores. Among Millennials, who represent nearly one in three (29%) of all value shoppers, 68% said they’re shopping more than they used to at discount grocers, and 70% said they’re doing so at dollar stores, according to the survey. 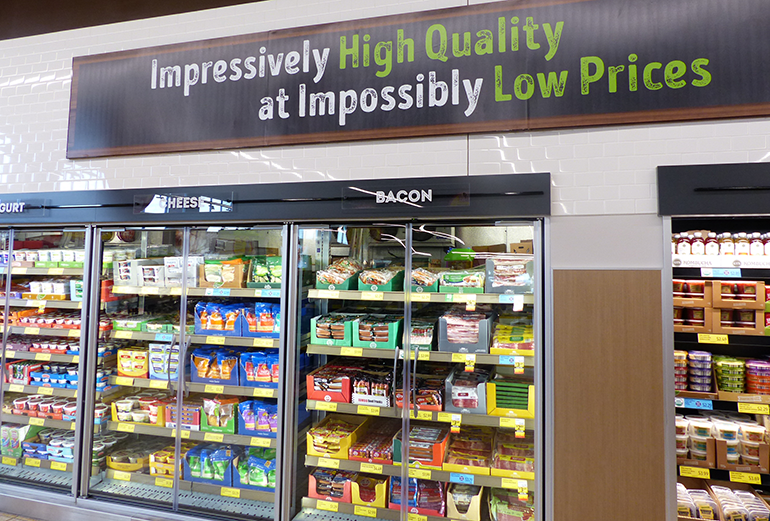 Sixty-two percent reported they’re going to off-price stores more often. Of Gen Z consumers, 52% shop at discount grocers (with 44% doing so weekly), 58% shop at dollar stores (with 73% doing so twice a month or more) and 64% shop at off-price retailers (with 48% doing so twice monthly or more). Region played somewhat of a factor with value shoppers, NRF’s research found. Thirty-eight percent of value shoppers live in the South, 23% in the West, 21% in the Midwest and 18% in the Northeast.